This is Part 1 of 5 of the special meal The Boy and I enjoyed this past Sunday. Never in my nearly 1 year of blogging, have I ever had a meal that included so many “blog-worthy” dishes. Some of these are things I’ve been making for a while, just haven’t gotten the energy to blog, and some are new recipes. The entire meal was VERY delicious. It’s nice to know we can enjoy the total restaurant experience, for a mere fraction of the price. Each component had a citrus theme, so they all tasted great together. I can’t wait to share each dish with you, I just hope I can get my blogging booty in gear to get it all done! Up first is our appetizer and drinks. I had some blue corn chips I purchased for the chili competition, but didn’t end up taking with me. While at the grocery I decided to pick up an avocado, so we could enjoy guacamole with the blue corn chips. 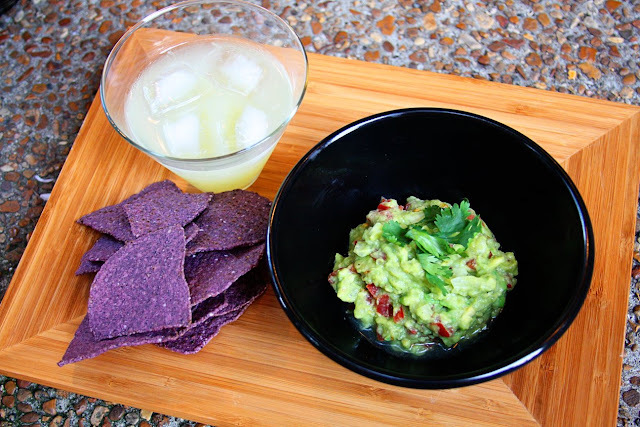 This is a basic, simple guacamole, that is also quite delicious. This is pretty much how I make it each time, and it’s never disappointed me. We enjoyed our appetizer while waiting for the chicken to finish cooking. It was perfectly complimented by my homemade margaritas. Stay tuned for the next post…. Tequila Citrus Chicken! Mash avocado with fork or back of spoon. Add onion, garlic, tomato, and stir to combine. Season liberally with salt, and pepper as desired. Add just a touch of lime juice to keep it from turning brown. Serve immediately. I am coming over for dinner one night. This looks like my kind of meal, I can't wait to hear about the tequila citrus chicken! I love Guacamole. I can eat it anytime and everytime! What a pretty picture! Can't wait to hear about your whole meal! I miss guacamole SO MUCH! I usually use garlic salt in mine just to mix things up a little.